Me love visiting the zoo! 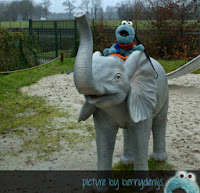 Just yesterday me went to me favourite zoo in Amersfoort… But me will tell you all about that later. Today me will talk about me visiting Dierenrijk in Nuenen. That is very close to the city of Eindhoven, here in the Netherlands. Yeah, yeah! Me love this zoo. 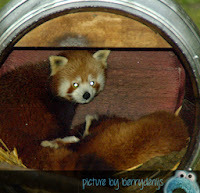 It is very different and they have cute polar bears! 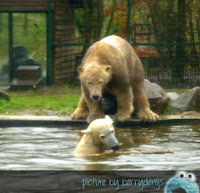 One was playing in the water, swimming and splashing! It was really cute. But me is getting ahead of meself. 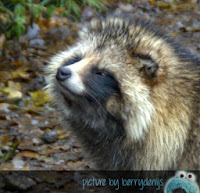 Me saw a lot of cute and gorgeous animals at Dierenrijk. 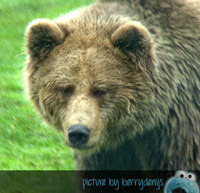 Me saw a coypu, some boar, camels, the polar bears of course, brown bears, tigers, wolves and a family of raccoon dogs. They look like raccoons, but aren’t. 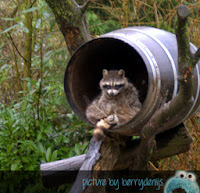 Me saw some red panda’s and regular raccoons too! 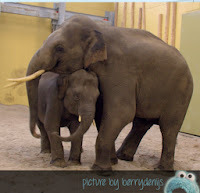 There is also a nice family of gorgeous elephants living at Dierenrijk. Me really loved to watch them hug and cuddle. But also to see the big Sibu at the presentation. 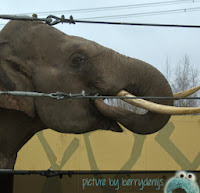 He showed his ears and his tusks to us. After that he went in with his family and tapped water with his trunk. It was magnificent. Me sure love elephants! After we left, we stopped to greet the meerkats. Me love meerkats. 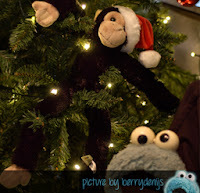 They are cute and have real character. 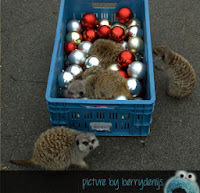 On the day we visited the meerkats got a big crate filled with food and Christmas ornaments. 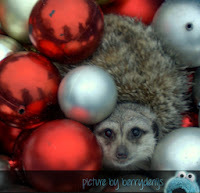 So the meerkats were digging through the plastic balls searching for their treats. It was so cute to watch. We had a great day at Dierenrijk. Me sure hope me will go there again someday soon.